Pressure is a non-directional force in gasses and liquids that is expressed as function of force over a given surface area (e.g. pounds per square inch or PSI). Depending on the application, it may be useful to know the pressure in a given environment in either absolute terms or relative terms. Absolute pressure refers to the amount of pressure in a certain system in relation to zero pressure. Relative pressure on the other hand, refers to the pressure as it relates to the ambient or surrounding pressure. Different types of pressure sensors employ various technologies. Sensors that use piezoresistive strain gauges take advantage of the electro-mechanical properties of certain materials. 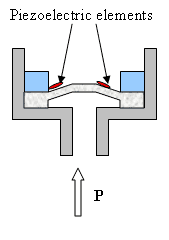 As pressure is applied to a diaphragm containing a piezoresistive element, the diaphragm deflects causing the piezoresistive element to bend resulting in a change in its resistance. The change in the resistance of the element can then be used to determine the pressure behind the diaphragm. Similarly, piezoelectric elements generate an electric potential proportional to the material deformation. Other pressure sensor technologies are based on electromagnetic, optical or potentiometric effects. Though the technologies differ, the basic principle behind them is the same. Each pressure sensor detects the strain or displacement of a material within the sensor and translates that information into a pressure value. Pressure sensors are used to measure various hydraulic and gas pressures in automotive systems. Hydraulic pressures for example are measured in the brake system, hydraulic suspension systems and at different points in the fuel system (e.g. the fuel pump and injection rail). Gas pressures are employed in tire pressure monitoring systems, pneumatic suspension systems and the air conditioning systems. A manifold absolute pressure sensor (MAP) may be used to determine the air pressure in the intake manifold relative to atmospheric pressure. Some engine control systems also measure the environment air pressure in order to calculate the air mass corresponding to a measured air volume in the intake manifold. In turbocharged engines, one or more air pressure sensors may be necessary to measure the charge pressure. Making Sense of Automotive Pressure Sensors, Dirk O. Keck, Sensors Magzine, August 1,2007. SensorsONE, Pressure sensor retailer website. Pressure Sensors Application Note, McLaren website. MAP or Manifold Air Pressure Sensor, YouTube, May 27, 2010. MAP Sensor & Wiring Diagram, YouTube, Jan. 19, 2011.